A decade back, Zoho Mail set out to become the best email platform. It has been an eventful and enjoyable journey since then. Over the years, we’ve evolved as a service, from a bare-bones communication tool to a feature-rich collaboration platform that meets the needs of businesses large and small. Getting this far would not have been possible without the continued support of our users. Thank you for all your feedback and support, without which we wouldn’t be what we are today. We couldn’t be happier to say that it has been an amazing 10 years. On this celebratory note, we are proud to announce that we have surpassed 10 million business accounts. In fact, on any given day, Zoho Mail’s servers process about 30 million emails. And in the time it’s taken you to read this post, more than 20k emails have passed through our system. We cannot thank you enough for helping us grow to this extent, and we’re glad that we’ve played a part in your business’s success. If you’ve enjoyed using Zoho Mail, go ahead and let others know about our easy-to-use email solution. If you still haven’t experienced how amazing Zoho Mail can be, sign up now! Congratulations ! keep growing and help people to fullfil their dream. I have used google all last 10 years as the base for my email and documents. So far, I am happy about Zoho email package and I hope you are able to do something about pricing for start-ups like me to increasingly use ALL your products! Thank you and while I am only a few months of your 10 years, I look forward to the next ten with you! Thank you for staying a private company. This keeps the customer as the focus instead of shareholders and stock market analysts. We appreciate you! From the http://www.accessinnov.com team! Parabéns, eu amo esse ferramenta! 1.000.000.000 de vezes PARABÉNS!!!!! Great Job Zoho! Cheers to another decade and many more users! I’ll never forget you! If it’s not you things would have not like this. Love you for everything! ? congratulations i hope all the best for you. Congratulations! thanks and the very best wishes! Long live, ZohoMail! Congrats Zoho! The best mail service!!! Congrats Zoho! The best mail service in town. Congrats, thanks and the very best wishes! Long live, ZohoMail! I was in search of using our company domain email. From many of free services, I picked zoho mail and never regret with my decision. That was the right and rational choice of mine! 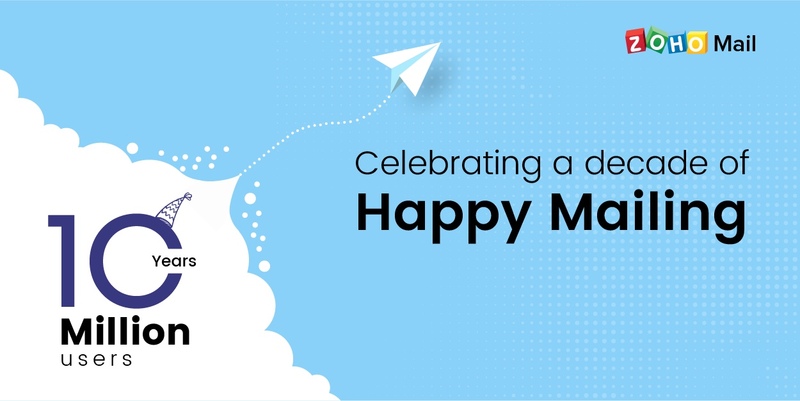 Millions of thanks to zoho on this auspicious day from https://yatrinepal.com Members. We wish you live long…. 🙂 Keep it up ? I am a new user and loving your services. I recommend all my friends to use zoho mail. Sem vocês, micro e pequenos empresários não poderiam ter acesso a uma plataforma tão intuitiva e eficiente como a de vocês. Thank for your services Zoho! When you got hit with the tropical storm that wiped out your headquarters, you kept your service up without a hitch (that I could see!) even while relocating your second tier support group AND their families to tents. I was beyond impressed and proud to be associated with you as I worked with your team while hearing the wind whistle in the background!! THAT is what we mean when we in the Intermountain West of the United States tell each other to “Cowboy Up!” Keep it up you Cowboys and Cowgirls! we are honor to be one of your client. You guys are awesome. Keep up the great work. All the best wishes for more years to come. Congratzzz! I,m happy using ZOHO, more user and more subscriber ahead! Great stuff – our decision to use Zoho has been one of the most critical choices since we opened shop. Looking forward to more from the amazing team. Thank you ZOHO for providing business-class email service, email client, features and functionalities and making it work beautifully. On behalf of the team at Scaling-Up! Ventures, we are grateful for the ZOHO Mail and platform of business applications. We are very happy with soho. We are a non profit language school in argentina and Soho has gave us the oportunity to use mail and other tools for our teachers and students. Thank you Team Soho and congratulations! Congratulations! Great experience using the service. Wish the IMAP service were still free. I know I tell people my email address @Zoho.com and still get confused looks which always gives me a chance to tell people how amazing your service is! I do belive in you guys I have been in Chennai at your place ! GOOD JOB keep it on ! Hey Zoho !!! huge congratch for turning to ten years.. wish you more hundred of years ahead. This year it may decline, as you made IMAP access not free. Wishing you double progress in coming half of those previous years… ? I am a BIIIIIIIIGGGGGG Fan of Zoho. Awesome Job over the last decade. Thumbs up and congrats! Commendable performance. Congratulations. Keep it up. Congratulations !!!!!!! !Thank you Team ZOHO. let everything doubles and Let’s believe in change is the Law of Progress. Congratulations. Thank you for your hard work to deliver good service. Congrats!!! You are a great team. Thanks for your apps, support and excellent staff. I’m from Colombia and I recommend Zoho Apps to all my customers. Best regards! I let gmail because of the abusive use of publicity. I have about 8 years in zoho and I’m still very happy with your great service. Keep the good work. You started back in 2008? Wow! That was way back in the Windows XP era! When computers were USER FRIENDLY! for novice and expert alike! And that spinner didn’t spin forever and then decide to never load your page! What I wouldn’t give to go back to the days of system stability on the Microsoft Platform!! Congratulations…You all deserve some accolades!!! Congratulations! Thanks for all your doing. Very best best wishes for the future. Congratulations on achieving this milestone.Best email platform i have use as gmail. Congratulations Zoho, and Cheers Team Zoho. Every time I had a query it was resolved and responded to and taken care of so very well. Ever since I came to know about Zoho and more particularly Zoho mail, I have been a Zoho fan. Thank you for all you do! Thanks for being there, for us. Congratulations. I am using your services from last 4 years and love what you are doing. Congratulations. I am using your services for a year and love what you are doing. Congratulations Zoho!!! You really done nice job. Great! Well done and best luck for reaching 100 million users! I am using your zoho mail for my startup JustPing Infotech a Surat(Gujarat) based IT Support & Services company. Congratulations on your first decade. Many more to come. Thankvyou very much. GRACIAS ZOHO, La mejor aplicación para las empresas que inician, una super herramienta empresarial. Felicidades desde México! Muchas Gracias! No dejen de mejorar, lo están haciendo muy bien. our communication has been fast and efficient. even we are trying how many diffrents zoho product usefull for our business. really we are happy from Zoho product. as per growing zoho user one day zoho will take 1st ranking in world. Congratulations 🙂 Thank You for all this years, efforts and providing such reliable and useful services. I remember using Zoho Mail, CRM, and People in 2008. I loved it then and I love it now. Zoho has been our go-to company for over 5 years. Today, our company uses Zoho CRM, Forms, SALESIQ (couldn’t live without it), Survey, Sites (Clinician Center), Mail, and DOCS. Thank you for continuously improving your products and introducing new ones. We’re elated to learn that you’re an extensive user of our products. We hope to continue building products that’ll suit your business needs. Keep using Zoho! Thanks for your kind words, Cherop. Keep using Zoho! Congrats Zoho Team , & wishing you many more success in coming years to come. We from Noveau Team & Neiv By Krisha Impex are really happy with your services and using your all products… This is just a beginning you guys will go long way…and help our company grow too using your great products…makes our life simple and doing business in a smartterway…. We’re elated to know that Zoho has helped your business grow. Thanks for your support. Congratulations. For me, Zoho has provided a brilliant service over many years – totally trustworthy, safe and secure. You kept your promises, and more. Thank you. Congrats for 10 years with million users! Parabéns…Só tenho agradecer, muito obrigadoooo!! Its Great achivement! All the very best for future. Zoho! you are indeed amazing. Thanks for your kind words, Joshua. Keep using Zoho! We, at Zoho, are glad to know that you enjoy using Zoho. Thank you! congrats for 10 yr with million users. god, bless you, guys. Its really amazing experience using Zoho services. congrats for 10 successful yr….. Thanks for your wishes, Krishna. Thoroughly enjoyed using Zoho products over the years. Here’s wishing Team Zoho all the very best in the coming years. Thanks for your wishes. Keep using Zoho! I enjoy working on most of the Zoho products, which addresses all my key areas of office. Keep churning out new things. Wishing you all the very best for future journey. We’re elated to know that Zoho serves the needs of your organization. Thanks for your support! I really feel good experience using Zoho Services. Many features are unique and tell us deep thoughts by the Zoho Team. My Good wishes to all the concerns and Stake holders of ZOHO Team. Thanks for your support. We are glad to know that you’re happy with Zoho services. We are really happy with your services. Long way to go..